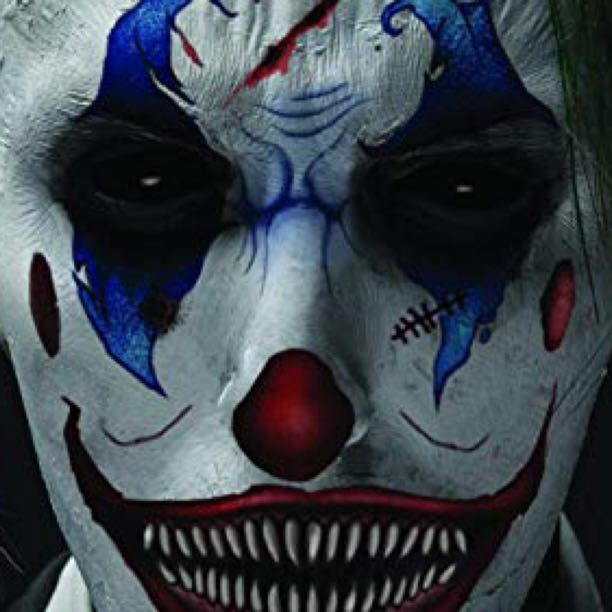 When I was younger I saw a poster that had a clown on it and it was very interesting to me because I had saw it every day that I walked to school. On that poster the clown had a suit and the buttons looked like crystal balls that you see psychics use to tell your future. One day I was walking past the poster and I saw something strange. There were eyeballs inside the crystal balls on the clown's jacket and as I walked past the poster, I noticed that they were following me. I was curious at the time so I naturally walked up to the poster and I started to put my hand on one of the crystal balls. When I did that my hand went through the poster and it felt like my hand was touching something wet. Something grabbed my hand  and pulled me in until my whole body landed on a hardwood floor. I was covered in some wet blue gunk and as I stood up, there was a clown inches away from my face. It smiled and as it did, it showed its teeth. They were sharp like those of a shark and his nose was bright red. Its eyes were pitch black and they had neither an iris nor a cornea either. It was almost like dark liquid was looking back at me. It opened its mouth wide and within a few seconds all seventy four of its teeth crunched right into my head. I felt the crushing pain of his teeth bearing down on my skull. It felt as if my skull was crushing under the pressure. I had no idea what to do. I just sat there and let it happen. Then suddenly, that's when I heard it, the snap of my skull breaking into multiple pieces as he ripped my head completely off my body. Immediately after, he devoured my body by crushing it in the same way as my cranium piece by piece. Afterwards it was like my soul had left my body. I was literally watching my body get devoured. As soon as the clown was finished doing that, it looked right at me and said "Seeing Is Believing". All of a sudden something started forcing me to come straight towards his face. It decided to open its mouth again and then I thought that I was about to die a second time but before I experienced the same agony all over again........... I blacked out. I opened my eyes and I was standing in front of that poster that I had always liked. I tore it off the wall, ripped it to shreds and for the first time ever, I ran to school!